Last weekend the first gooseberries arrived at the market. They were the bright green, super tart, barely ripe berries that make exceptional pectin. I do this preserving for the art, the connection to some ancient way, long before grocery stores and boxes of pectin. I want to take the magic ingredients of fruit, sugar and heat and make something amazing. So I make my own pectin. It’s ridiculously easy. Four pints of gooseberries produced 32 ounces of pectin and that will get me through the season. I plan for four ounces of homemade pectin per batch of jam, presuming three pounds of prepared (peeled, diced, pits removed) fruit in each batch. 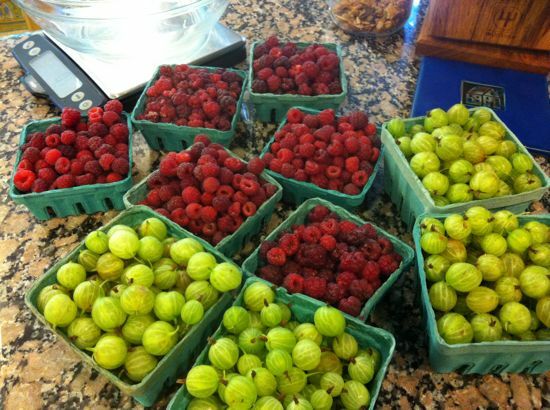 Along with those gooseberries at the market were fragrant, beautiful local raspberries. I’m an addict when it comes to raspberries. I just can’t walk away from them. Raspberry jam may be the simplest to make, but I like it most for the aromas in the kitchen. It’s intoxicatingly sweet and floral and I stand over the bubbling fruit and inhale. I have been anticipating this batch of raspberry jam for nearly a year. 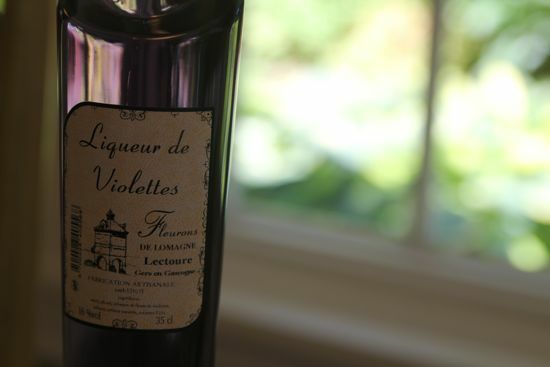 Last fall, while at Kate Hill’s Camont, for Grrls Meat Camp*, I found a gorgeous bottle of violet liqueur. I was drawn to it as much for the color as the possibility of the flavor, and knew it would find a place in fruit preserves. Indeed, it’s remarkable, and while I know you may not have access to a liqueur like this one, you will find all sorts of interesting flavors if you go poking around at the liquor store. Just substitute any liqueur in equal amounts. Of course, there’s no reason you can’t make this, or any other liqueur, yourself… but that’s another post for another day. Today, it’s all about gooseberry pectin and raspberry preserves, two preserving projects in season now. * Grrls Meat Camp is moving stateside this year – October 25-28 near Chicago, IL. Check in at Kate’s website for more info. 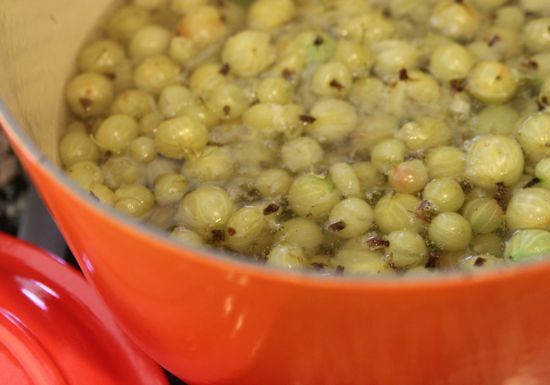 Put the gooseberries and water into a heavy preserving pan and cook at a slow simmer for 45 minutes. 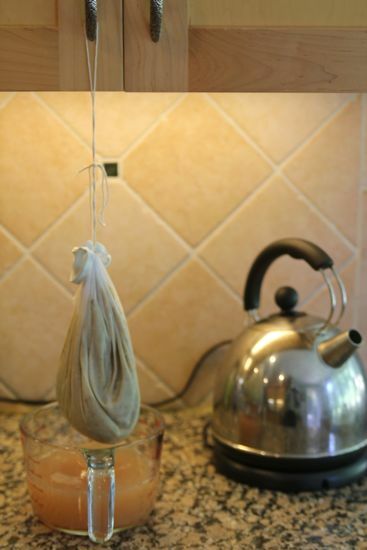 Strain in a jelly bag or through three layers of cheesecloth. Drain for six hours. Reheat the pectin, bringing it to a simmer and skimming any detritus. Prepare the canning pot with boiling water and sterilize the jars. Test the set of the pectin. Drop 1 tsp of pectin stock into 3 Tablespoons of gin. It should form a ball, if, instead, the pectin disperses into small clumps, cook it for another ten minutes and try again. 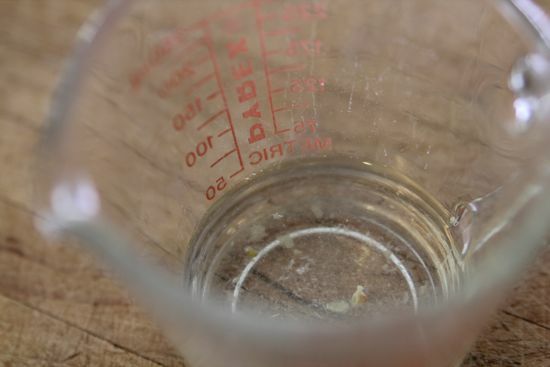 Process the jars for 10 minutes in a boiling water bath. Can’t find gooseberries? Use 8 cups of prepared green apples, not Granny Smiths, but apples that are unripe. Cut them up, then put core, peel, everything into the preserving pan and proceed with the recipe. This pectin is not ready yet. The photo of the pectin that formed a clump? Out of focus. Sad face. This preserves is full of raspberry seeds. I like ’em. If you don’t, run the berries through a fine food mill and reduce the sugar by 1/2 cup. Your yield will be slightly less. Do not wash the berries – you will wash away the essence. This is why it is critical to purchase raspberries from the best farmers, people you trust. Right in the preserving pot, stir together the berries with the sugar and lemon juice gently but thoroughly. Allow this mixture to macerate and combine for one hour. Turn the heat on under the pot and slowly raise the temperature, stirring all the while. It will take about one hour to come to a good sturdy boil and thicken. It’s the simplest of all preserves, elegant and richly raspberryish. But it’s also very easy to burn. And it’s easy to take off the heat too soon. So stir away, and get to know your preserves. Watch how the bubbles change in character. How the sound of the spoon along the bottom of the pan changes as the preserves thickens. When it’s where you want it to be (do you like your jam runny? it’s YOUR jam!) add the liqueur. Stir well, then turn off the heat and ladle into jars, leaving 1/4″ headspace. Wipe the rims and place the lids and rings. I ordered Violet Extract for this very purpose. I can’t wait until raspberries start appearing in the Farmer’s markets this year. I am going to try with blueberries as well. I did make a Strawberry jam with Rose water that is heavenly. I also want to try Blueberry Lavender. Cathy, the way you write about getting to know your jam just made me swoon. This raspberry jam sounds great, and it reminded me: I dearly want to make an elderflower spiked raspberry jam. i love the picture of the liqueur bottle! and the recipe instruction “get to know your preserves.” you writing empowers cooks to do what they’re thinking. la cuisine sells fantastic french essences — i always have rose, lavender, fiori di scilia and peppermint on hand — and violet is in their repertoire. And THIS is why I love you Cathy. Green apples (unripe, not Granny Smith) have the same high pectin quality. See the recipe for swap outs. Love the gooseberry pectin idea. I just made a batch of Ferber’s apple pectin stock, in preparation for summer fruits to arrive at the farmers market! Does the gin test work for for apple pectin stock? ps…Your recipe for Mai Tai preserves was amazing. I am hoarding my last jar! Yes, the Gin Test will work on any pectin. I like the apple pectin a lot and will be making a batch of that, too. The gooseberry is more tart, and doesn’t have the pronounced apple flavor. I’m glad you liked the Mai Tai preserves! I just polished off a jar yesterday and miss it already! Sorry if this is a dumb question but, do you add 4oz. of the pectin to the jam? I’ll be posting some recipes using the pectin over the next few weeks. In the meantime, just substitute the homemade pectin for any recipe using liquid pectin. Thank you, hoping to find everything to get started on jam tomorrow at the farmers market. This came at the perfect time….can’t wait till you post the recipes. Great idea..didn’t know u could make pectin this way. Was wondering how do u store pectin 4 later use?? Do u need to put in waterbath? Or just fridge?? I like to water bath the jars, but you can also freeze it. It will not keep well in the refrigerator. My home-grown gooseberries have been dedicated in past years to pies and sorbet, and I was thinking of trying to make gooseberry chutney this year as well. Don’t know if I can sacrifice all those treats for making pectin — does it really make jams taste that much better than commercial pectin? I’ll admit I’m a bit crazy… I just like to make everything from scratch. I’m particularly interested in knowing what’s in my food, and that’s why I make my own pectin. Gooseberries aren’t available here (NM) and green apples aren’t in season at the moment. Are there other options for making your own pectin? if not, what is the ration of commercial liquid pectin that you would recommend per batch? Must it be fine or would vodka would as well? Damn – meant gin.. Would vodka suffice? Hi Jill – Maybe? I read three sources for how to test pectin. The first suggested denatured alcohol – like Sterno. Well, I spent some time wondering what spoon I could use (and throw away) after measuring 3 T of Sterno…. So, when I found two references that used gin or whiskey for the pectin test, that’s what I went with. I would give vodka a try (and let us know if it works!) I happened to have some cheap gin lying around, so that’s what I used. Thanks Cathy.. Eager to try this. Also hunting for green apples, and but I suspect it’s too early? If you don’t know a grower is it best to negotiate with a farmer’s market seller? 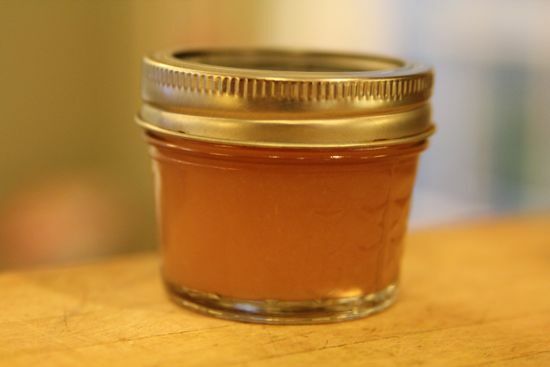 What a treat – I’ve always wanted to figure out homemade pectin. Now I don’t have to! Cathy, where did you get the gooseberries? I found them at Lafayette Farmer’s Market on Broad Branch and Northampton (Saturdays). Susan Behl (Nob Hill Farm) has a bumper crop this year. They’re at Pallisades Market on Sundays. Now that I have your secret recipes…. The raspberries at Camont are just starting to pop like crazy including the golden raspberries along side the chicken coop orchard. Can’t wait for a quiet day to pick, eat and pectin away. I’ve got lots of unripe apples in that orchard too! Merci! The immature, green gooseberries make the strongest pectin, but gooseberries as a rule are just packed iwth pectin, so the ripe ones you used will still be effective. wikipedia says that denatured alcohol can be use to test pectin. I have no gin but I do have rubbing alcohol! Will try tomorrow. I made the gooseberry pectin yesterday, but it never seemed to get to a stage where it balled in the gin. I had it reducing for over an hour on the stove. I had it at about 200 on a candy thermometer when I transferred it into jars. I guess my question is, will it still work? It still came out to 8 x 4 ounce jars. I expect it will work! The ball isn’t a hard stiff ball like taffy making, and it can be hard to suss out the first time, but if it reached 200 you are sure to have some gel power. Made plum jam (Tzar plums) and it didn’t set. Usually make with Victoria plums without any bother. My mother used to use the odd bottle of pectin from the supermarket but it is pretty well impossible to find anywhere nowadays. Not many people make jam any more. Then I remembered a recipe I used before adding gooseberry juice to Strawberry jam. Went out and raided the last of the Gooseberries and made up some juice (which I now know is Pectin!!). Unfortunately they were pretty overripe – so it may not work as well. AND I have a garden full of windfall, under ripe apples. Could have used them instead – much easier to pick (up) instead of getting puctured so many times. So, rethink, not going to get rid of the Gooseberry bushes because I will have a ready supply of pectin for all jams until the apples take over. Did you use any gooseberry pectin in your raspberry jam? Our gooseberries are leaning over with unripe berries.When making jams, I use 9cups of fruit to 6 cups of sugar, and have been lucky so far. Regular pectin uses too much sugar. I find that raspberries have enough pectin to set without any added commercial or homemade pectin. If you haven’t been getting the set you like, just cook it a bit longer. The gooseberry pectin is expecially helpful with cherry jam.